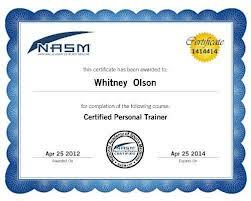 The NASM personal trainer certification has continued to grow in popularity. And while its not considered the hardest of the personal trainer tests, the NASM exam is not easy. With a pass rate hovering around 50% for first time takers, you are going to want to devote some serious time toward preparing for the test. There are 120 questions on the exam. You must complete the exam within 2 hours. You need to get at least 70 out of 120 questions right to pass the exam according to NASM. But NASM mixes in 20 research questions that don't count toward your passing score. This can be stressful because they don't tell you which questions are research questions. So theoretically it is possible to fail the exam even if you get 89 questions correct. 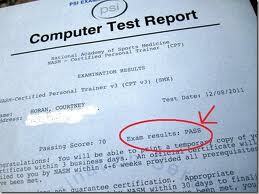 NASM tell us that only 50% of candidates pass the exam on the first try. So don't take this one lightly. You will need to study smartly to avoid failing the exam and have to pay the $199 fee to take the exam again. It is important that potential NASM CPT candidates understand that the NASM exam must be taken within 180 days of enrollment. Previously that time limit was 120 days, but was changed due to some of the problems this short time caused some people. Nevertheless, if it is not possible to complete the exam in the stated amount of time, it is possible to get an extension of 90 days by paying an additional fee of $75. For this reason, it may be better to hold off on enrolling until the time is right. You've got a choice of study materials. You can purchase the official NASM study program that includes the textbook, videos, practice exam, study guide, webinar coaching series, online learning, iPod video, MP3 audio and the actual exam starting at $629. But if you can't afford to that, you can self-study and take the NASM CPT 4th exam for $599. Not much savings so you are better off coming up with the extra cash for the study materials. A word of warning... don't rely completely on the NASM practice exam. You can read a lot of discussions below about how the NASM practice exam is not a realistic preview of what the real exam is like. You should plan on taking our Exam Prep Course. With over 750 practice questions for only $32.95, it is a great insurance policy against having to pay $199 to take the NASM exam again. Also because our NASM pass rates are so high, we offer a pass or don't pay guarantee that gives you double your money back if you fail the NASM exam. Have You Taken the NASM Exam? The section below gives our readers the chance to talk about their experience with the NASM exam. After you take your exam, remember to come back and tell us how you did and what worked for you! Our readers submit some great tips about passing the NASM personal trainer certification exam. Read the tips and add your comments and ratings to each tip. The NASM Exam is Easy!